This synthesis paper summarizes published proxy climate evidence showing the spatial and temporal pattern of climate change through the Holocene in Arctic Canada and Greenland. Our synthesis includes 47 records from a recently published database of highly resolved Holocene paleoclimate time series from the Arctic (Sundqvist et al., 2014). We analyze the temperature histories represented by the database and compare them with paleoclimate and environmental information from 54 additional published records, mostly from datasets that did not fit the selection criteria for the Arctic Holocene database. Combined, we review evidence from a variety of proxy archives including glaciers (ice cores and glacial geomorphology), lake sediments, peat sequences, and coastal and deep-marine sediments. The temperature-sensitive records indicate more consistent and earlier Holocene warmth in the north and east, and a more diffuse and later Holocene thermal maximum in the south and west. Principal components analysis reveals two dominant Holocene trends, one with early Holocene warmth followed by cooling in the middle Holocene, the other with a broader period of warmth in the middle Holocene followed by cooling in the late Holocene. The temperature decrease from the warmest to the coolest portions of the Holocene is 3.0 ± 1.0 °C on average (n = 11 sites). 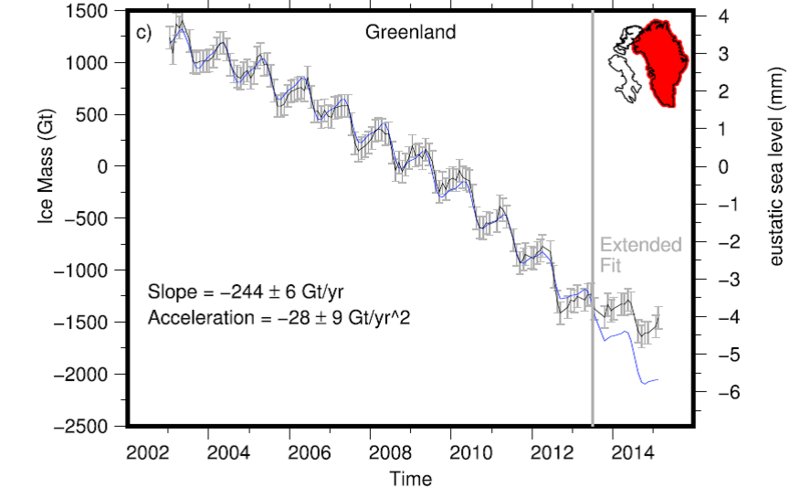 The Greenland Ice Sheet retracted to its minimum extent between 5 and 3 ka, consistent with many sites from around Greenland depicting a switch from warm to cool conditions around that time. The spatial pattern of temperature change through the Holocene was likely driven by the decrease in northern latitude summer insolation through the Holocene, the varied influence of waning ice sheets in the early Holocene, and the variable influx of Atlantic Water into the study region. In der Arbeit wird auch eine Kurve der Flächenveränderungen des grönländischen Eisschildes während der vergangenen 10.000 Jahre gezeigt, basierend auf einer Modellierung von Larsen et al. 2015 (Abb. 1). Schön zu erkennen das Schrumpfen des Eises nach der letzten Eiszeit. Vor etwa 5000 Jahren erreichte das Eis dann seine geringste Ausdehnung und wuchs in der Folge bis heute wieder an. Das heutige Abschmelzen wirkt dagegen eher untergeordnet. Abbildung 1: Flächenveränderungen des grönländischen Eisschildes während der vergangenen 10.000 Jahre. Graphik: Briner et al. 2016 nach einer Modellierung von Larsen et al. 2015. The history of Greenland’s snowfall is chronicled in an unlikely place: the remains of aquatic plants that died long ago, collecting at the bottom of lakes in horizontal layers that document the passing years. Using this ancient record, scientists are attempting to reconstruct how Arctic precipitation fluctuated over the past several millennia, potentially influencing the size of the Greenland Ice Sheet as the Earth warmed and cooled. An early study in this field finds that snowfall at one key location in western Greenland may have intensified from 6,000 to 4,000 years ago, a period when the planet’s Northern Hemisphere was warmer than it is today. While more research needs to be done to draw conclusions about ancient precipitation patterns across Greenland, the new results are consistent with the hypothesis that global warming could drive increasing Arctic snowfall — a trend that would slow the shrinkage of the Greenland Ice Sheet and, ultimately, affect the pace at which sea levels rise. “As the Arctic gets warmer, there is a vigorous scientific debate about how stable the Greenland Ice Sheet will be. How quickly will it lose mass?” says lead researcher Elizabeth Thomas, PhD, an assistant professor of geology in the University at Buffalo College of Arts and Sciences who completed much of the study as a postdoctoral fellow at the University of Massachusetts Amherst. “Climate models and observations suggest that as temperatures rise, snowfall over Greenland could increase as sea ice melts and larger areas of the ocean are exposed for evaporation. This would slow the decline of the ice sheet, because snow would add to its mass,” Thomas says. “Our findings are consistent with this hypothesis. We see evidence that the ratio of snow to rain was unusually high from 6,000 to 4,000 years ago, which is what you would expect to see if sea ice loss causes snowfall to increase in the region.” The research was published on May 23 in Geophysical Research Letters, a journal of the American Geophysical Union. Thomas’ research looks to understand how precipitation changed in the past, with an eye toward better predicting how modern warming will affect the Earth. “We are using the past to see what might happen in the future,” she says. Aquatic leaf waxes are a relatively new tool for completing this work. They reveal information about the seasonality of precipitation — how amounts of ancient summer rain compared to amounts of ancient winter snow. To understand how aquatic leaf waxes function as a historical record, you need to know a little about aquatic plants. In the Arctic, these organisms survive on lake water, and use hydrogen atoms from this water to produce wax coatings on leaves. These hydrogen atoms are the key to studying precipitation: In years when the ratio of summer rain to winter snow in a region is high, lake water and aquatic leaf waxes end up containing high levels of a rare form of hydrogen called deuterium, which is heavier than “normal” hydrogen. (This is because summer rain holds more deuterium than winter snowfall.) In contrast, in years when snow is relatively abundant, aquatic plants start producing waxes with less deuterium. This is what Thomas and her colleagues saw when they extracted a long, cylindrical sediment sample from a lake bottom in western Greenland. The mud contains ancient leaf waxes, with the oldest at the base of the column and the youngest at the top. By dating and analyzing thin slices of the sample, the team determined that aquatic leaf waxes had low levels of deuterium from 6,000 to 4,000 years ago. This is exactly what researchers would expect to see if the warm temperatures of that time had fueled sea ice loss, leading to increased Arctic snowfall and a decline in deuterium in lakes, Thomas said. She acknowledged that it’s possible that a drop in summer rainfall accounted for the changes in deuterium, but says a rise in winter snowfall is the more likely explanation, as scientists have found independent evidence that the region was wetter 6,000 to 4,000 years ago. The research team included UB Associate Professor of Geology Jason Briner; undergraduate student John J. Ryan-Henry from Brown University, the University of Rhode Island and the Roger Williams University School of Law; and Professor Yongsong Huang from Brown University and the Chinese Academy of Sciences. The study was funded by the National Science Foundation and research grants from the Geological Society of America. Abb 2. Veränderung der grönländischen Eismasse während der letzten 15 Jahre. Quelle Harig & Simons 2016. Over the past several decades mountain glaciers and ice caps have been significant contributors to sea level rise. Here we estimate the ice mass changes in the Canadian Archipelago, the Gulf of Alaska, and Greenland since 2003 by analyzing time-varying gravimetry data from the Gravity Recovery and Climate Experiment. Prior to 2013, interannual ice mass variability in the Gulf of Alaska and in regions around Greenland remains within the average estimated over the whole data span. Beginning in summer 2013, ice mass in regions around Greenland departs positively from its long-term trend. Over Greenland this anomaly reached almost 500 Gt through the end of 2014. Overall, long-term ice mass loss from Greenland and the Canadian Archipelago continues to accelerate, while losses around the Gulf of Alaska region continue but remain steady with no significant acceleration. Greenland’s snowy surface has been getting darker over the past two decades, absorbing more heat from the sun and increasing snow melt, a new study of satellite data shows. That trend is likely to continue, with the surface’s reflectivity, or albedo, decreasing by as much as 10 percent by the end of the century, the study says. The culprits are two feedback loops that are created by the melting itself. One of those processes isn’t visible to the human eye, but it is having a profound effect. The feedback loops work like this: During a warm summer with clear skies and lots of solar radiation pouring in, the surface starts to melt. As the top layers of fresh snow disappear, old impurities, like dust from erosion or soot that blew in years before, begin to appear, darkening the surface. A warm summer can remove enough snow to allow several years of impurities to concentrate at the surface as surrounding snow layers disappear. At the same time, as the snow melts and refreezes, the grains of snow get larger. This is because the meltwater acts like glue, sticking grains together when the surface refreezes. The larger grains create a less reflective surface that allows more solar radiation to be absorbed. The impact of grain size on albedo – the ratio between reflected and incoming solar radiation – is strong in the infrared range, where humans can’t see, but satellite instruments can detect the change. The findings, published in the European Geosciences Union journal The Cryosphere, have global implications. Fresh meltwater from Greenland’s land-based ice raises sea level and could affect ocean ecology and circulation. The study used satellite data to compare summertime changes in Greenland’s albedo from 1981 to 2012. The first decade showed little change, but starting around 1996, the data show that due to darkening, the ice began absorbing about 2 percent more solar radiation per decade. At the same time, summer near-surface temperatures in Greenland increased at a rate of about 0.74°C per decade, allowing more snow to melt and fuel the feedback loops. A likely cause for the large shift around 1996 was a change in atmospheric circulation, Tedesco said. The North Atlantic Oscillation, a large-scale natural weather cycle, went into a phase in which summer atmospheric conditions favored more incoming solar radiation and warmer, moist air from the south. Later records show those conditions shifted in 2013-2014 to favor less melting, but the damage was already done – the ice sheet had become more sensitive. In 2015, melting spiked again to reach more than half of the Greenland ice sheet. While new snowfall can make the ice sheet brighter again, the dark material built up during the melt years is waiting just below the surface, preconditioning the surface to future melting, Tedesco said. The scientists also ran a computer model to simulate the future of Greenland’s surface temperature, grain size, exposed ice area and albedo. Over the current century, the model projects that the average albedo for the entire ice sheet will fall by as much as 8 percent, and by as much 10 percent on the western edge, where the ice is darkest today. Those are conservative estimates – the change could be twice that, Tedesco said. The scientists looked into the hypothesis that soot from forest fires in China, Siberia and North America could be driving the increased darkening of the ice sheet. Using the Global Fire Emissions Database, they analyzed trends in black-carbon emissions from wildfires in those regions and Europe. While the amount of black carbon released by fires varied year to year, the scientists found no statistically significant increase during 1997-2012 to match the darkening of Greenland. The study also raises questions about whether Greenland’s high plateau is darkening as previous reports have suggested. The scientists found no long-term trend of darkening at the top, and they suspect that the Terra MODIS satellite sensor that has detected darkening in the past may actually be degrading, as previous studies have suggested. At lower elevations, the signal is much stronger. The feedback loops could be stopped with lots of snowfall and less melting, but that doesn’t seem likely given the increasing concentration of greenhouse gases in the atmosphere, Tedesco said. And while warming is expected to increase precipitation, that precipitation includes increasing rainfall, which speeds up melting. Melting is also moving to higher elevations as global temperatures warm. “As warming continues, the feedback from declining albedo will add up,” Tedesco said. “It’s a train running downhill, and the hill is getting steeper.” Co-authors of the paper are Sarah Doherty of the University of Washington; Xavier Fettweis of University of Liege; Patrick Alexander of NASA Goddard Institute of Space Studies and City University of New York; Jeyavinoth Jeyaratnam of the City College of New York; and Julienne Stroeve of University of Boulder. Earlier recent work has shown that the east, southeast and northwest regions of the Greenland ice sheet have contributed to 77% of the total mass loss over the last century. Now, researchers have used gps data to show that the east, southeast and northwest also contributed significantly to ice mass loss in the past, over thousands of years: about 40% of the total loss of ice mass. The researchers, amongst which Utrecht University climate researchers Bert Wouters and Peter Kuipers Munneke, are publishing their results in Science Advances on 23 September. The researchers also measured the changes in height of the land masses under the melting ice. When land ice melts, the land underneath rises, since the ice no longer weighs it down. The researchers found that land masses in the southeast of Greenland have risen by about 12 millimeters per year. The results indicate that these basins have solely contributed to an ice mass loss corresponding to global sea level rise of 1.5 m over the past millennia. It seems likely, therefore, that further destabilisation of these ice sheet regions will continue to be the main source of sea-level rise in the future, the authors say. Mass loss of the Greenland ice sheet has increased over the last twenty years, mainly because glaciers are accelerating and the surface of the ice sheet is melting faster and faster. However, due to a lack of in situ observations in key regions it is still difficult to accurately establish how much mass the ice sheet loses over a period of thousands of years and how much it contributes to global sea-level rise. The research also shows that some calculations of present-day mass loss of the Greenland ice sheet may be underestimated: the new measurements show that Greenland loses about 7 percent of ice per year more than previously assumed. An ancient basin hidden beneath the Greenland ice sheet, discovered by researchers at the University of Bristol, may help explain the location, size and velocity of Jakobshavn Isbræ, Greenland’s fastest flowing outlet glacier.The research also provides an insight into what past river drainage looked like in Greenland, and what it could look like in the future as the ice sheet retreats. The size of the drainage basin the team discovered is very large, at around 450,000 km2, and accounts for about 20 per cent of the total land area of Greenland (including islands). This is comparable to the size of the Ohio River drainage basin, which is the largest tributary of the Mississippi. The channels the team mapped could more appropriately be called ‘canyons’, with relative depths of around 1,400 metres in places, and nearly 12km wide, all hidden underneath the ice. As well as being an interesting discovery of great size, the channel network and basin was instrumental in influencing the flow of ice from the deep interior to the margin, both now and over several glacial cycles, as well as influencing the location and speed of the Jakobshavn ice stream.